It would be remise not to pay tribute to our support crew. Graham, or Hedgy to his friends, leads the team and is the perfect man for the job. No task is to hard or to small. No request from either rider or cook is insignificant. If something needs to be done, he will find a way to do it. The support crew is divided into two teams. The road crew who drive with the cyclists and the ground crew who look after washing and cooking. Wesley travels with either of the teams, helping and also getting to know the riders, as does Rihanna, our videographer. There are eight road crew, two per vehicle and two vehicles per team. The road crew keep our cyclists safe on the road. They manage the flow of traffic as it passes the cyclists and at each rest stop they are there helping the cyclists with heir gear, keeping them fed and topping up their water bottles. The ground crew are amazing. the prepare all the food, supplying food for the riders to take on the road, a snack when they arrive in the afternoon, breakfast and dinner. The conditions that they sometimes have to cook under can be challenging. However, every meal is nutritious and full of flavour. You hear no complaints, just people asking for seconds. In addition, they wash all the clothes over night, ready for the riders to wear the next day. Back on the road and back into the countryside. We leave the city of Wodonga behind and are heading to Bright. Once again rolling green hills and pastoral vistas. The wattles are in full bloom and in every creek bed there is a weeping willow. The sky is clear, the sun is shining and days are warmer. We have left the cold weather behind, well almost. The mornings are still very cool and by the end of the day we will be heading into the Victorian snow fields. We are in Victoria which is the land of coffee drinkers. For every coffee drinker there is a good barista. And what do all good cyclists like to do, drink good coffee. There are two coffee stops planned today. The first in the small country town of Yackandandah and twenty-five kilometres later, a roadhouse in Dederang. These two towns have been reconnoitred to ensure the quality of the coffee is good. In both towns, not only good coffee but good service. Yakandandah also provided giant cakes. Both teams are traveling well today. As usual Team Twenty-seven left first soon followed by Team Twenty. You may be wondering how the teams got their names. Team Twenty-seven are more experienced riders. They are disciplined in their riding and average twenty-seven kph. Team Twenty, while also strong riders, average twenty kph. Team Twenty-seven arrived into Yackandandah, ordered their coffee and enjoyed a short break. Just as they finished and were climbing onto their bikes, Team Twenty rolled in. The happy barista had just finished making the first teams order and had to start again. The same happened in Dederang. As Team Twenty-seven were leaving, Team Twenty rolled in. It shows the strength of Team Twenty to match the pace of the Twenty-sevens. It was also a good time for some brief but positive interaction between the two teams. Today we leave the country town of Colac Colac and head for the regional city of Wodonga. 157kms across country to Lake Hume and then following the shore line into Wodonga. There were a couple of big hills, however, for every hill that went up, there was a hill that went down. After the first big hill climb for the day, Jonathan, one of the Team Twenty riders said “I enjoyed that”. The riders are getting stronger. The temperature was warmer, the sky was clear, the sun was shining. 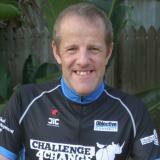 Team Captain Paul mentioned that the whole team enjoyed todays ride. Our riders were provided spectacular scenery when they reached Lake Hume. An old disused railway has been converted into a bikeway. The riders were dropped on the opposite side of Lake Hume to ride the bikeway. This included crossing the lake via a long bridge, giving them a 360-degree vista of the lake. What a great way to finish a day’s riding. The riders met up with their road crew for the final ride into town and their accommodation. We woke this morning, looked out our windows and saw the surrounding paddocks covered with a white blanket of snow, kangaroos hopping through the snow, grazing on the grass beneath. A postcard winter wonderland. However, this is spring and we have a job to do. A mini snowman was built on one of the picnic tables, all before breakfast. As the sun rose higher our snowman watched the rest of the snow dissipate clearing the way for todays ride. Our goal today is to ride up Kosciuszko as far as Perisher Valley and while the day started in snow we had relatively clear skies. The good news is no one got wet. It was definitely chilly and as predicted colder than yesterday. a thirty-five kilometre climb and then a thirty-five kilometres down hill rush. Our riders were able to ride up at their own speed. No bunch riding up the mountain. Each one was able to ride within their own ability. While it was a hard ride, reaching the end was a great sense of achievement. The team dynamics are also starting to develop which is preparing the way for the longer rides over the next few days.